In 1991, Codemasters released one of the greatest racing/party games of all time: Micro Machines. Despite a few sequels, it's all but forgotten these days, Mario Kart casting a very long shadow over that style of game. But hey, good news: Codemasters just released what's basically a remake! To very little fanfare, a game called Toybox Turbos was released on Steam today. 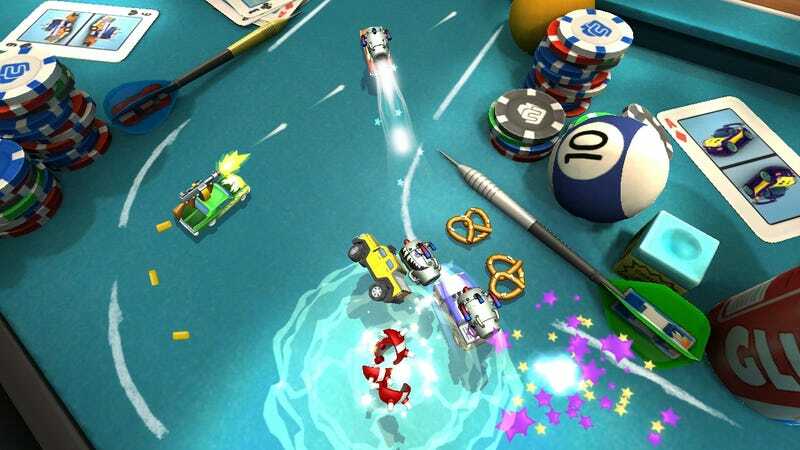 Developed by Codemasters, it's Micro Machines in all but name, with the same scale of track (you race tiny cars across giant kitchen tables and bedroom floors), same single-screen chaos and same emphasis on shortcuts and bumping opponents off the track. Before you ask, yes, it supports 4-player local multiplayer. It's $15 on Steam.